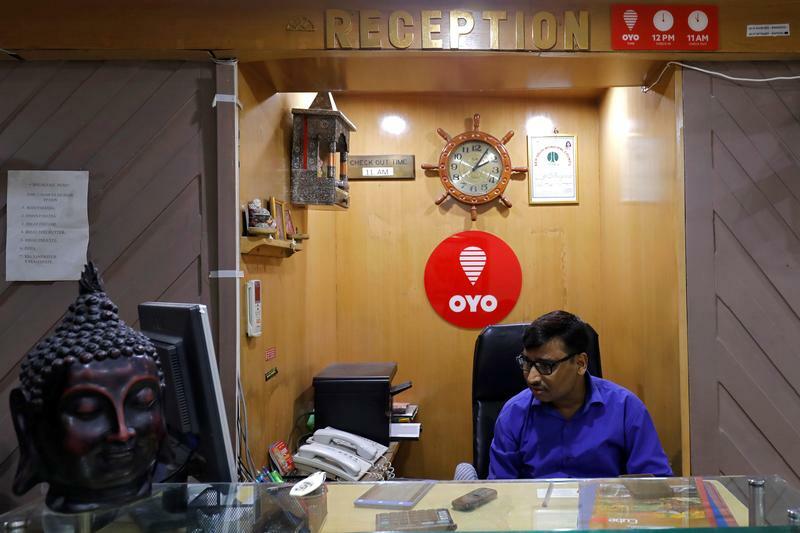 An employee sits next to the logo of OYO, India's largest and fastest-growing hotel chain, at the reception of a hotel in New Delhi, India, September 25, 2018. China’s Didi Chuxing has invested almost $100 million into Indian hotel startup Oyo, according to a filing dated Jan. 22, sourced through business signals firm paper.vc. The investment, made through a unit called Star Virtue Investment Limited, was part of a September $1 billion fundraising led by Japan’s SoftBank. Oyo’s investors include Lightspeed Venture Partners, Sequoia Capital, Greenoaks Capital, and Hero Enterprise among others. Oyo partners with budget hotels, operating them under lease agreements or through a franchise model. The company helps to standardise the rooms and services, and before selling the Oyo-branded rooms to travelers through its website and travel partners. As of December, Oyo had over 450,000 rooms globally. It operates in over 500 cities across eight countries.